- He was the uncredited music mixer for Christmas in Connecticut (1945), where Mr. Schwump apparently appeared briefly. 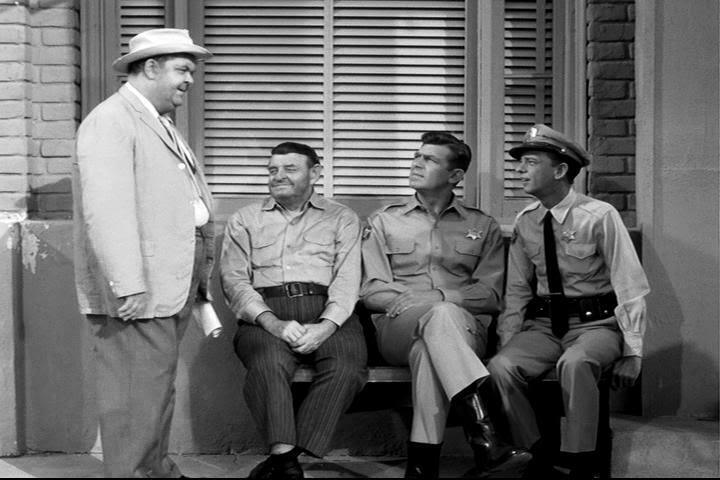 - He was also the sound engineer for nearly all of the Andy Griffith Show episodes during the first four seasons. - He would have been 61 years old at the time of My Fair Ernest T. Bass, Mr. Schwump's first appearance. - After that, he did a lot less sound department work. As David Forrest's sound engineer career was winding down, Mr. Schwump began appearing. Could he have appeared as Mr. Schwump for fun? My searches for Schwump / Schwamp & David Forrest didn't return anything, so I'm hoping this hasn't already been ruled out. However, I won't be too surprised if everyone else knows that he looks nothing like Mr. Schwump! Beats me, but you might be on to something. Sounds like a good lead. Very good posibility, now if we could just find a photo of David Forrest. Nice contribution Steve, we need to get Barney on this right away! This doesn't help the David Forrest idea, but I thought it was kind of funny. Maybe there is a graduation picture out there somewhere with him holding his hands the same way. Oh no....this seems like an actual lead to the identity of Mr. Schwamp (a.k.a. Mr. Schwump). Great job, Steve! This is certainly something folks can work on tracking down. Good noticing! This seems like the best lead we've had since...well, maybe ever. Let's get to work. A sound engineer that doesn't talk. Priceless! Could be a good lead Steve. I found a Charles D. Forrest in the 1930 census on South Gardener Street in L.A., 29 years old w/ wife, year old daughter and servant. He was an electrical engineer. I'm not sure if this is the same guy, and it's not a very good pic, but does anyone think this could be Mr. Schwump in his early 20's? Thank you for the replies. I'm glad it wasn't a ridiculous idea, but I also hope it wouldn't be a big letdown like Howard catching Old Sam. I found him on eBay, but only where they listed a movie's credits and he was involved. Maybe something will show up there in the future. That 29 year old Charles D. Forrest is sure interesting, but I am really bad at those kind of comparisons. I have a horrible time recognizing people I haven't seen for a while. Luckily, I haven't had any guys in dark glasses come to the door saying to lay off the Schwump theory! I think you may be onto something, Steve and Bobby. That picture looks (to my untrained eyes) like it very well could be a young Mr. Schwump. Bobby Fleet's census info also seems to fit the right time line. Way to go, guys! I think you're onto something. I found various forms of his name, which I suppose he used at different stages of his career. They are: Dave Forest, David Forest, Charles D. Forrest, Dave Forrest, David Forrest. My source listed his birth date as 9/8/02. He was working on TAGS during 1960-64--as I understand it, all episodes. His name also appears in many well-known movies, among them MILDRED PIERCE. Maybe the non-speaking, no-credits nature of Mr. Schwamp had something to do with union regulations? I know nothing about SAG, but thought maybe his being a sound engineer or whatever would preclude his being a credited actor. I think they have to appear so many times with so many speaking parts to be able to join The Screen Actors Guild. The main thing we need now, it seems to me, is another (later) photo of Charles D. Forrest for comparison with Mr. Schwamp. By the way, I saw him last night on the episode where Sam welcomes his friend from Italy and all the family shows up too, etc. Mr. Schwamp is sitting on the front row when they have the meeting where they sing "Santa Lucia". At least he wasn't leaning up against the wall in a stag line! I think his appearances, mainly are as an extra or background actor. Normally they are not listed in the credits. Look like you have some pretty good leads here! Parents were Charles and Gertrude Forrest. His father and maternal grandfather were born in US. A passport application in 1924 listed him as student at Berkeley with birth date and place consistant with his other records. Various voting registration records in Burbank, Los Angeles county from 1936 - 1954 show him on National Ave. and employeed as a sound engineer. I am going to persue getting a copy of his obituary, but by all means if anyone is in that area and can run down to a local library or history center and get it off their microfilm, by all means go for it.